Articulate Storyline is one of the many “Rapid Development Tools” on the market today. Along with Adobe Captivate it is one of the most popular and premier tools. The idea behind software like Storyline is to make it easier for learning developers to create quality courseware in a timely manner. 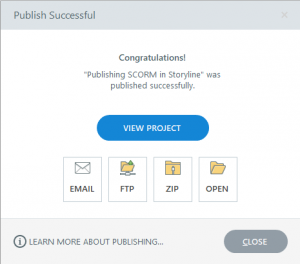 Storyline makes developing SCORM compliant content easier too. It has a streamlined interface for publishing the SCORM features you generally need. While it is simple and quick, if you are very experienced working with SCORM you may find it somewhat limiting. There are not as many options once you get into the works than what you might encounter in other programs. Yet for the learning developer who wants to create compliant content quick, it’s a gem. Let’s take a look at how the process works. In our example here, we worked with Articulate Storyline 360 which is the latest version. It is available as part of Articulate 360 on a subscription basis. As with any other project, you want to first establish a title and description as well as where you will publish the content. Again, these are things you must always do regardless of the project type. Click Publish from the toolbar. Select the LMS tab on the left. Designate the Folder where you wish to publish the content. Storyline will create a sub-folder for the specific project underneath the chosen folder. 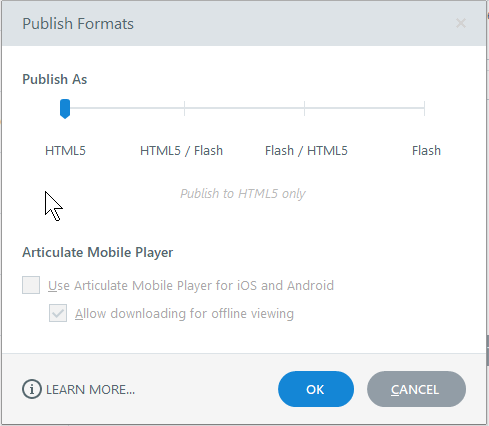 With the popularity of HTML5 increasing and Flash Player decreasing, programs like Storyline provide you with options to go one way or the other. You can also choose hybrid solutions that provide both as alternatives. Click the Format the appears under the Properties heading. In the Publish Formats dialog box, drag the Publish As slider to the appropriate choice. For most applications today, your best choice is either HTML5/Flash or HTML5. If you choose any option other than HTML5 you can also choose to produce a mobile player. Articulate Storyline allows you publish standards compliant content for AICC, xAPI, or SCORM. Our purpose here is SCORM 2004. Once we identify the standards, we must also provide information that allows the LMS to differentiate the course with a unique course ID. Keywords are also a good idea and in some cases may even be mandatory. Click Reporting and Tracking Options under Output Options. Make sure the Reporting tab is selected, then use the LMS drop-list to choose the appropriate SCORM option. If you choose SCORM 2004 you need to also choose the Edition. Set the Identifier under LMS Course Information. This will usually become the course ID. You should have some system for course ID, whether it is established by your LMS or self-developed. The general practice is to never start a course ID with a number. It’s a good idea to also Keywords, especially if you want the course to searchable within an LMS that provides that capability. So we have identified a course, however, we also need to identify the SCO within the course. Like most Rapid Development Tools, there is not really capacity here for multiple-SCO’s within the course. We’ll talk about alternatives later. If different from the course title, add the SCO Title. Add a SCO Identifier. This will become the SCO ID. No need to get fancy here. Most just put the letters SCO followed by an underscore and a three or four digit number (e.g. SCO_001). Under the LMS Reporting section, use the drop-list to set the Report status to LMS as: option. If you are not sure which to choose, go with Complete/Incomplete. If there is a scored quiz, you will normally choose Passed/Incomplete or Passed/Failed. We’re still not done with this. We need to determine how we will track. 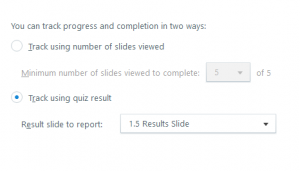 Articulate Storyline provides the option to track either by slide completion or by quiz results, but not both. This is somewhat of a limitation but also less complex than in other applications. Click the Tracking tab in the Reporting and Tracking dialog box. Choose the appropriate tracking option. If you are simply tracking completion you would choose the first option. You would then normally set completion based on viewing all the slides. If you have a scored quiz you can choose the second option. That’s all the options. The next part is to go ahead and publish. There will be two parts here. The first is to actually publish all the files necessary for the course to run in the LMS. The second part is to create the course package so the LMS can import it. Remember that most LMS’s require a zip file package. Once it completes you will get the Publish Successful dialog box. To package for your LMS, select the Zip option. A dialog box will appear to select where the zip file will be saved. Select the appropriate location. Click Save. Once the package is complete, Storyline will automatically open a file browsing window to the location. After closing the file window, you can click Close to clear the Publish Successful dialog box. If you have a test LMS, make sure you test your project out there before going live. Otherwise, you may want to look at another testing option like SCORM Cloud. It allows you to set up a free account where you can upload courses for testing to determine that the tracking works. 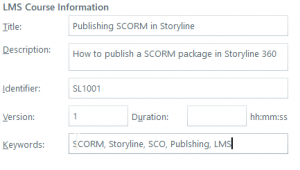 If you have the need to assemble multiple Storyline courses into one larger SCORM package you can use Simple SCORM Packager by JCA Solutions. It’s an excellent solution to produce a multi-SCO course. You can also produce a multi-SCO course using courses produced from other applications as well. Having other challenges developing and uploading courses? Want more guidance? Contact JCA Solutions (support@jcasolutions.com) today. Let’s get you on the road to done!